Thomas Case (1598-1682) was an English clergyman of Presbyterian beliefs, member of the Westminster Assembly where he was one of the strongest advocates of theocracy, and sympathizer with the Restoration of the Stuart monarchy. He was educated at Canterbury and Merchant Taylors’ School. A student of Christ Church, Oxford in 1616, he graduated M.A. in 1623. A curate at North Repps, Norfolk, he became incumbent of Erpingham. He was preacher at Manchester and Salford, 1635 but was prosecuted for contempt of church ceremonies in both dioceses (Norwich and Chester). His marriage to Anne Mosley of Ancoats in 1637 brought him into an influential family, connecting him to Salford chapel by her late husband and to John Angier. 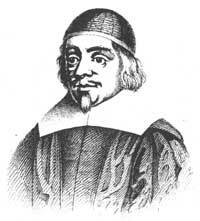 He was lecturer in several London churches 1641-2, and a member of the Westminster Assembly from 1643. He was intruded rector of Stockport, Cheshire, in 1645-6. He was ejected by Parliament from the rectory of St. Mary Magdalen, Milk Street in 1649, after he refused the engagement. Then he spent time as a lecturer in Aldermanbury and Cripplegate. He was arrested on 2 May 1651, becoming one of the ministers imprisoned in as privy to the presbyterian plot to recall Charles II, along with William Blackmore, Roger Drake, Matthew Haviland, Arthur Jackson, William Jenkyn, Christopher Love who was singled out as ringleader, Ralph Robinson, and Thomas Watson. He spent about six months in the Tower of London. Subsequently he was rector of St. Giles-in-the-Fields, London, from about 1652. A sermon on Exodus 5:22-23. Psalm 94:12. Also known by the title “Correction, Instruction”. Digital Puritan Press has reprinted this title. More information here. Want to discuss something pertaining to Thomas Case? Leave a public comment below (subject to moderation), or send a private message to the webmaster.